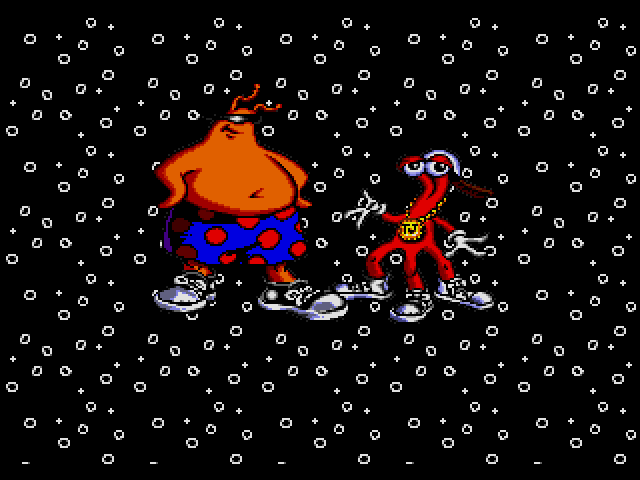 Before we start, let’s meet Toejam & Earl, two funky aliens from the planet Funkotron! Cruisin’ through the galaxy, one day those two were a little neglecting with regard to asteroid belts usually found between the third and fourth planet of a solar system – just like in the solar system where Earth is located. One asteroid crash leads to the other, and so all the two poor aliens can do is crash-land on Earth. Bummer. If that is not punishment enough, their rocketship fell apart in ten pieces which spread out all over Earth. That poses a kind of dilemma for Toejam & Earl, who didn’t expect to be on Earth, but on Funkotron by dinner. But what can they do? Explore Earth, evade Earthlings, open presents, find the ship pieces, assemble the ship and fly home, of course! 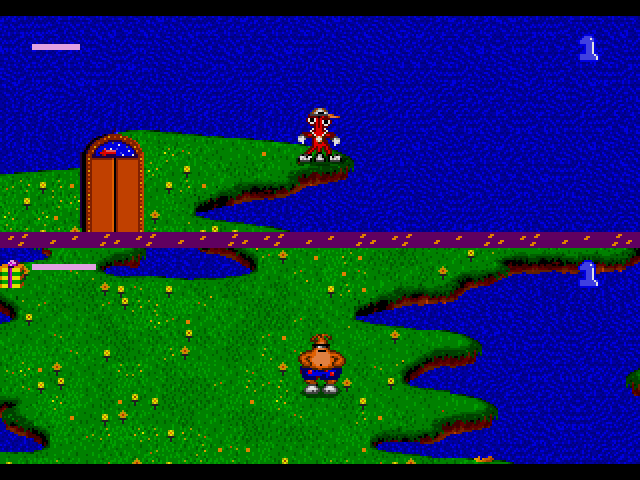 As you can see above, the Earth in Toejam & Earl looks a little… well… unearthly. The game is made up of around 20 stages/levels, each of them looking like pieces of Earth spread around Outer Space. Weird. 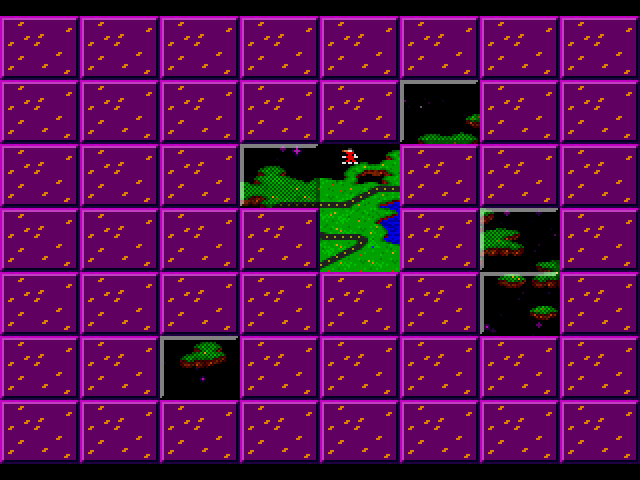 Anyway, the game’s goal is to explore these stages “tile by tile” to find the missing rocketship pieces. While exploring Earth, Toejam face Earthlings. Some of these Earthlings are quite unearthly as well though, or when was the last time you saw a little pink pig-devil dancing around on Hawaii? Right. Talking of Hawaii, an earthly Earthling you will encounter and enjoy quite often is an Aloha dancer. Apart from the Aloha dancer, there are many other Earthlings to be discovered through the game’s course. Not all of them are fun to meet – devils sting, boogey-men scare and mad doctors pierce (laughing piercingly whilst at it). Some Earthlings are nice to be found though, especially the wise carrot man. Why? Because he is so wise that he can determine the content of presents without opening them, Wait – presents? As you usually do when you explore Earth on your own as aliens, you find presents. Lots and lots of presents, such as bonus hiptops. 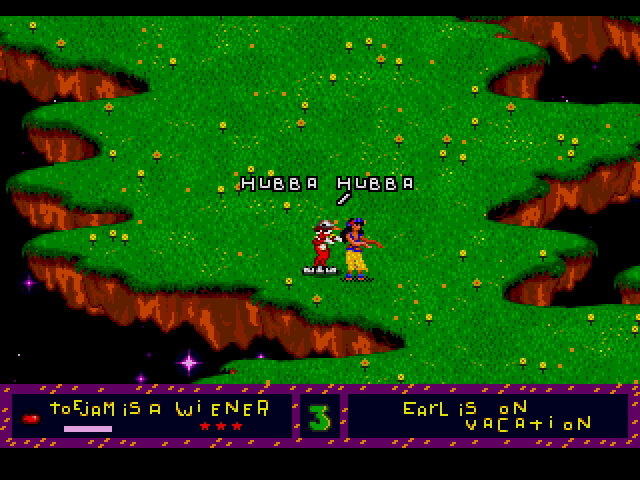 The really greatest thing about Toejam & Earl is the two-player splitscreen mode, shown below. One player playing Toejam, the other one Earl, makes exploring Earth all the more fun. Explore the stages twice as fast! Or go all the way together – because only if Toejam & Earl are nearby (the split-screen merges into one screen then), points and presents’ contents are shared evenly among both! This approach brings a very nice element of coop-mpetion into the game. Because, after all, YOU want to become Funklord first – or you want to become it together? 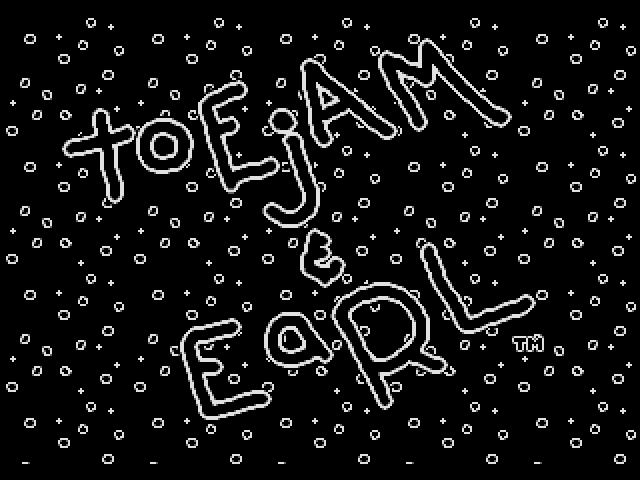 Toejam & Earl deserves a place in the Great Games Society because of it’s sheer funkiness and the immense fun a two player “competitive cooperative” game can be. The creativity which went into the game is awesome. The game is full of weird and extremely fun ideas, be it Earthlings like the Mad Doctor or cool presents to be found like the Ikarus Wings. It was lucky that Sega decided to give the game a chance, even if it was so unlike any other game seen before. It is a real gaming jam, pardon me gem, and I’m sure that generations will keep on exploring Earth, collecting presents and keep on jammin’ with a pair of good old bonus hitops. Kudos to the creators for creating (keep on creatin’ – good luck with the Kickstarter! ), and kudos to Sega for publishing! 2H+ X – Although the game can be completed in around 1,5 to 2 hours, this is not recommended. A leisurely played game can take much more time than that… Usually around 3 hours. The original Sega Genesis cartridge does not have any means of saving a game state, so the only way to play it in chunks of 2 hours max is to find a safe spot, let Toejam & Earl rest (actually, they fall asleep! ), turn off the TV, leave the Sega Genesis turned on and come back the next day. Well… Let's count that anyway. Presentation O – The cartoonish art style, funky music, intro and elevator intermezzi are well made, but nothing special. Story O – The story is fun, but quite simple. No novel stuff. Immersion X – Especially immersive with two players – you can't quit until all rocketship pieces have been found. Also, due to the rather slow gameplay and vast stages, the game can even be a little meditative at times. Until the boogey-man comes. Social X – Toejam & Earl is one of the most fun cooperative two-player games ever made. Exploring Earth as two humans impersonating two funky aliens is extremely fun. FOAK X – Toejam & Earl is unique. Period. Metacritic O – The highest MobyRank score of a respected game mag is only 73 (Edge), so unfortunately Toejam & Earl misses the target set for this criterion. Longevity X – Toejam & Earl became a brand and spawned sequels in the 1990'ies (Toejam & Earl 2) and 2000's (Toejam & Earl 3). Also the games were successfully re-published on modern video game consoles' retro shops. There is currently an attempt to crowdfund a reboot of the first game on Kickstarter – Toejam & Earl: Back in the Groove." This entry was posted in 1991 and tagged Action, Sega Genesis by Goethe. Bookmark the permalink.